Synthetic peptide within Human Vimentin aa 400 to the C-terminus (C terminal) (acetyl ). The exact sequence is proprietary. WB: HeLa, HEK293, Jurkat, A549, NIH3T3, PC12, HUVEC, Daudi, Caco-2 and COS-1 cell lysates; mouse and rat brain tissue lysates. IHC-P: Human kidney, colon, breast adenocarcinoma, cervical carcinoma and ovarian cancer tissues, mouse brain and kidney, E17 rat cheek and rat skin tissue sections; Rhesus monkey retina tissue. IHC-Fr: Mouse testis tissue. ICC/IF: HeLa, human adenocarcinoma, human schlemms canal endothelium and wildtype HAP1 cells. Flow Cyt: HeLa cells. Our Abpromise guarantee covers the use of ab92547 in the following tested applications. WB 1/1000 - 1/5000. Predicted molecular weight: 54 kDa. Flow Cyt 1/50 - 1/500. 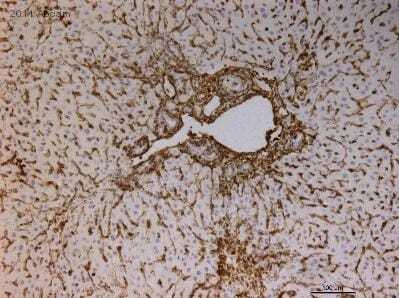 Immunohistochemistry (Formalin/PFA-fixed paraffin-embedded sections) - Anti-Vimentin antibody [EPR3776] - Cytoskeleton Marker (ab92547)Image from Prestigiacomo V et al., PLoS One. 2017;12(6):e0179995. Fig 7.; doi: 10.1371/journal.pone.0179995. Immunostaining of formalin fixed paraffin embedded human microtissues after exposure to MTX, TAA and TGF-β1. Formalin fixed paraffin embedded slides of HepaRG/THP-1 macrophages/hTERT-HSC microtissues were stained with Hematoxylin & Eosin (H&E) and vimentin after 14 days of treatment with MTX, TAA and TGF-β1. Microtissues were fixed in 4% PFA and embedded in 2% agarose prior to paraffinization. Microtissues showed increase in the vimentin positive cells after MTX, TAA and TGF-β1 exposure. Vimentin stainings show proliferation of stellate cells and THP-1 macrophages in the microtissues, suggesting the onset of inflammation process. For full image see PMID 28665955. Immunohistochemistry (Formalin/PFA-fixed paraffin-embedded sections) - Anti-Vimentin antibody [EPR3776] - Cytoskeleton Marker (ab92547)Image from Muniz-Talavera H and Schmidt JV., PLoS One. 2017;12(12):e0184957. Fig 3.; doi: 10.1371/journal.pone.0184957. JhylacZ/lacZ mice exhibit delayed radial glial to ependymal cell differentiation. Immunohistochemical analysis of P10 lateral ventricle coronal sections from Jhy+/+ (A, E) and JhylacZ/lacZ (I, M) mice for expression of Vimentin (pink, ab92547), Glast (green) and Acα-Tub (orange) in dorsal (A-D, I-L) and ventral (E-H, M-P) brain regions. Lower right panels (D, L, H, P) represent a higher magnification view of the merged image. In Jhy+/+, medial wall dorsal and ventral cells express the differentiated ependymal markers Vimentin (A, B, E, F) and Acα-Tub (A, D, E, H), but are negative for the radial glial marker Glast (A, C, E, G). In JhylacZ/lacZ brains, some dorsal cells remain positive for the undifferentiated marker Glast (I, K), while also expressing the differentiated markers Vimentin and Acα-Tub (I, J, L). JhylacZ/lacZ ventral cells express only Vimentin and Acα-Tub (M-P). The dotted line indicates the medial wall ependymal cells in (C, G, K, O). (Q-R) Graphical representation of the percentage of Glast(-)Vimentin(+)Acα-Tub(+) (black bar) and Glast(+)Vimentin(+)Acα-Tub(+) (grey bar) cells in dorsal (Q) and ventral (R) ependymal cells. MW, medial wall; LW, lateral wall; LV, lateral ventricle; * denotes p≤0.05. Scale bars: 50μm (A-P). Formalin-fixed, paraffin-embedded rhesus monkey retina tissue stained for Vimentin (green) using ab92547 at 1/200 dilution in ICC/IF. Goat anti-rabbit AlexaFluor 488 was used as the secondary. Immunohistochemical staining of paraffin embedded human cervical carcinoma with purified ab92547 at a working dilution of 1/250. The secondary antibody used is HRP goat anti-rabbit IgG H&L (ab97051) at 1/500. The sample is counter-stained with hematoxylin. Antigen retrieval was perfomed using Tris-EDTA buffer, pH 9.0. PBS was used instead of the primary antibody as the negative control, and is shown in the inset. IHC image of unpurified ab92547 staining Vimentin in human breast adenocarcinoma formalin-fixed paraffin-embedded tissue sections*, performed on a Leica Bond. The section was pre-treated using heat mediated antigen retrieval with sodium citrate buffer (pH6, epitope retrieval solution 1) for 20 mins. The section was then incubated with ab92547, 1/200 dilution, for 15 mins at room temperature and detected using an HRP conjugated compact polymer system. DAB was used as the chromogen. The section was then counterstained with haematoxylin and mounted with DPX. No primary antibody was used in the negative control (shown on the inset). Immunofluorescence staining of HeLa (human epithelial cell line from cervix adenocarcinoma) cells with purified ab92547 at a working dilution of 1/250, counter-stained with DAPI. The secondary antibody was Goat Anti-Rabbit IgG H&L (Alexa Fluor® 488) (ab150077) secondary antibody, used at a dilution of 1/1000. ab7291, a mouse anti-tubulin antibody (1/1000), was used to stain tubulin along with Goat Anti-Mouse IgG H&L (Alexa Fluor® 594) preadsorbed (ab150120) 1/1000, shown in the top right hand panel. The cells were fixed in 4% PFA and permeabilized using 0.1% Triton X 100. The negative controls are shown in bottom middle and right hand panels - for negative control 1, purified ab92547 was used at a dilution of 1/500 followed by Goat Anti-Mouse IgG H&L (Alexa Fluor® 594) preadsorbed (ab150120) at a dilution of 1/500. For negative control 2, ab7291 (mouse anti-tubulin) was used at a dilution of 1/500 followed by Goat Anti-Rabbit IgG H&L (Alexa Fluor® 488) (ab150077) secondary antibody at a dilution of 1/400. ab92547 staining Vimentin in wild-type HAP1 cells (top panel) and VIM knockout HAP1 cells (bottom panel). The cells were fixed with 100% methanol (5min), permeabilized with 0.1% Triton X-100 for 5 minutes and then blocked with 1% BSA/10% normal goat serum/0.3M glycine in 0.1% PBS-Tween for 1h. The cells were then incubated with ab92547 at 0.5μg/ml and ab195889 at 1/250 dilution (shown in pseudocolour red) overnight at +4°C, followed by a further incubation at room temperature for 1h with Goat Anti-Rabbit IgG H&L (Alexa Fluor® 488) preadsorbed (ab150081) secondary antibody at 2 μg/ml (shown in green). Nuclear DNA was labelled in blue with DAPI. ab92547 staining Vimentin in HeLa (human epithelial cell line from cervix adenocarcinoma) cells. The cells were fixed with 100% methanol (5min) and then blocked in 1% BSA/10% normal goat serum/0.3M glycine in 0.1%PBS-Tween for 1h. The cells were then incubated with ab92547 at 5μg/ml and ab7291 at 1µg/ml overnight at +4°C, followed by a further incubation at room temperature for 1h with Goat Anti-Rabbit IgG H&L (Alexa Fluor® 488) preadsorbed (ab150081) secondary antibody at 2 μg/ml (shown in green) and Goat Anti-Mouse IgG H&L (Alexa Fluor® 594) preadsorbed (ab150120) at 2 μg/ml (shown in pseudo color red). Nuclear DNA was labelled in blue with DAPI. Overlay histogram showing HAP1 wildtype (green line) and HAP1-VIM knockout cells (red line) stained with ab92547. The cells were fixed with 80% methanol (5 min) and then permeabilized with 0.1% PBS-Triton X-100 for 15 min. The cells were then incubated in 1x PBS / 10% normal goat serum to block non-specific protein-protein interactions followed by the antibody (ab92547, 0.5µg/ml) for 30 min at 22°C. The secondary antibody used was Goat Anti-Rabbit IgG H&L (Alexa Fluor® 488) preadsorbed (ab150081) secondary antibody at 1/2000 dilution for 30 min at 22°C. A Rabbit IgG isotype control antibody (ab172730) was used at the same concentration and conditions as the primary antibody (HAP1 wildtype - black line, HAP1-VIM knockout - grey line). Unlabelled sample was also used as a control (this line is not shown for the purpose of simplicity). Immunohistochemical staining of paraffin embedded mouse kidney with purified ab92547 at a working dilution of 1/250. 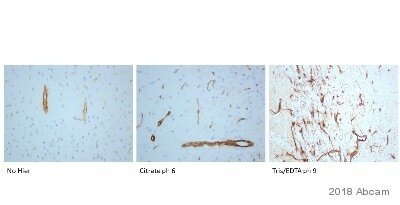 The secondary antibody used is Goat Anti-Rabbit IgG H&L (HRP) (ab97051) secondary antibody at 1/500. The sample is counter-stained with hematoxylin. Antigen retrieval was perfomed using Tris-EDTA buffer, pH 9.0. PBS was used instead of the primary antibody as the negative control, and is shown in the inset. Unpurified ab92547 staining Vimentin in HeLa cells. The cells were fixed with 100% methanol (5 min), permeabilized in 0.1% Triton X-100 for 5 minutes and then blocked in 1% BSA/10% normal goat serum/0.3M glycine in 0.1% PBS-Tween for 1h. The cells were then incubated with ab92547 at a working concentration of 5μg/ml and ab195889, Mouse monoclonal [DM1A] to alpha Tubulin (Alexa Fluor® 594, shown in red) at 1/250 overnight at +4°C, followed by a further incubation at room temperature for 1h with Goat Anti-Rabbit IgG H&L (Alexa Fluor® 488) preadsorbed (ab150081) secondary antibody at 2 μg/ml (shown in green). Nuclear DNA was labelled in blue with DAPI. Overlay histogram showing HeLa cells fixed in 2% PFA and stained with purified ab92547 at a dilution of 1 in 50 (red line). The secondary antibody used was FITC goat anti-rabbit at a dilution of 1 in 500. Rabbit monoclonal IgG was used as an isotype control (black line) and cells incubated in the absence of both primary and secondary antibody were used as a negative control (blue line). Immunohistochemical analysis of frozen mouse testis tissue sections labelling Vimentin with ab92547 at a dilution of 1/500. The sections were fixed with Paraformaldehyde and Permeabilized with 0.1% Triton X-100 in PBS. Ab150062 at 1/500 was used as the secondary antibody. Tissue was counterstained with DAPI. This blot was produced using a 4-12% Bis-tris gel under the MOPS buffer system. The gel was run at 200V for 50 minutes before being transferred onto a Nitrocellulose membrane at 30V for 70 minutes. The membrane was then blocked for an hour using LI-COR® blocking buffer before being incubated with ab92547 overnight at 4°C. Antibody binding was detected using the IRDye® 800CW Goat Anti-Rabbit secondary at a 1:10,000 dilution for 1hr at room temperature and then imaged using the Odyssey® CLx Imaging System. Anti-vimentin (ab92547) staining in E17 rat cheek sections using immunohistochemistry (formaldehyde-fixed, paraffin-embedded sections). Heat-mediated antigen retrieval was carried out using citric acid. Samples were incubated with primary antibody (1/2000) for two hours at room temperature. A biotin-conjugated goat anti-rabbit IgG polyclonal was used as the secondary antibody. 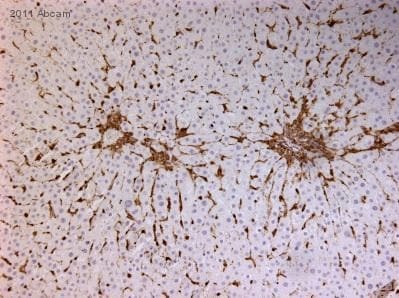 Anti-vimentin (ab92547) staining in adult mouse brain (the dentate gyrus region of the hippocampus) using immunohistochemistry (formaldehyde-fixed, paraffin-embedded sections). Heat-mediated antigen retrieval was carried out using citric acid. Samples were incubated with primary antibody (1/2000) for two hours at room temperature. A biotin-conjugated goat anti-rabbit IgG polyclonal was used as the secondary antibody. Anti-vimentin (ab92547) staining in human ovarian cancer tissue using immunohistochemistry (formaldehyde-fixed, paraffin-embedded sections). Heat-mediated antigen retrieval was carried out using citric acid. Samples were incubated with primary antibody (1/2000) for two hours at room temperature. A biotin-conjugated goat anti-rabbit IgG polyclonal was used as the secondary antibody. Immunohistochemical analysis of formalin/PFA-fixed paraffin-embedded human cervical carcinoma tissue sections labeling Vimentin with ab92547. Immunohistochemical analysis of formalin/PFA-fixed paraffin-embedded human kidney tissue sections labeling Vimentin with ab92547. 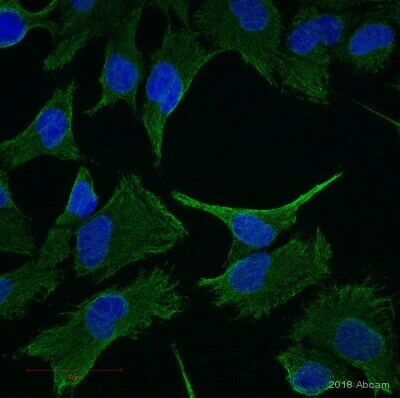 Immunocytochemistry/ Immunofluorescence - Anti-Vimentin antibody [EPR3776] - Cytoskeleton Marker (ab92547)This image is courtesy of an anonymous Abreview. ab92547 staining Vimentin in human adenocarcinoma cells by ICC/IF (Immunocytochemistry/immunofluorescence). Cells were fixed with paraformaldehyde, permeabilized with 0.1% TX-100 in PBS and blocked with 5% serum for 1 at 21°C. Samples were incubated with primary antibody (1/400) for 12 hours at 21°C. A CY3® conjugated donkey anti-rabbit polyclonal was used as the secondary antibody at 1/200. Unpurified ab92547 staining vimentin in human Schlemms Canal Endothelium cells by ICC/IF (Immunocytochemistry/immunofluorescence). Cells were fixed with formaldehyde, permeabilized with Triton X-100 0.2% and blocked with 10% serum for 30 minutes at 20°C. Samples were incubated with primary antibody (1/200 in DPBS) for 3 hours at 20°C. An undiluted Alexa Fluor®488-conjugated Goat anti-rabbit IgG polyclonal was used as the secondary antibody. 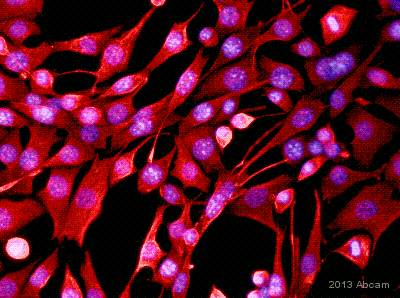 Overlay histogram showing HeLa cells stained with unpurified ab92547 (red line). The cells were fixed with 80% methanol (5 min) and then permeabilized with 0.1% PBS-Triton X-100 for 20 min. The cells were then incubated in 1x PBS / 10% normal goat serum / 0.3M glycine to block non-specific protein-protein interactions followed by the antibody (ab92547 , 1/100 dilution) for 30 min at 22°C. The secondary antibody used was Goat Anti-Rabbit IgG H&L (DyLight® 488) preadsorbed (ab96899) at 1/500 dilution for 30 min at 22°C. Isotype control antibody (black line) was rabbit IgG (monoclonal) (1µg/1x106 cells) used under the same conditions. Acquisition of >5,000 events was performed. This antibody gave a positive signal in HeLa cells fixed with 4% paraformaldehyde/permeabilized in 0.1% PBS-Triton X-100 used under the same conditions. Fluorescent immunohistochemical analysis of paraffin-embedded human normal kidney tissue using unpurified ab92547. Green- Vimentin red-PI. 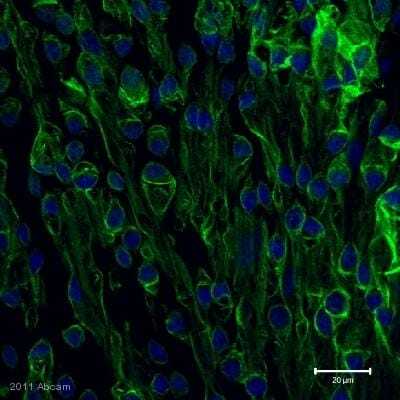 Immunohistochemistry (Formalin/PFA-fixed paraffin-embedded sections) - Anti-Vimentin antibody [EPR3776] - Cytoskeleton Marker (ab92547)This image is courtesy of an anonymous Abreview. ab92547 staining Vimentin in rat skin tissue sections by Immunohistochemistry (IHC-P - paraformaldehyde-fixed, paraffin-embedded sections). Tissue was fixed with 10% buffered normal formalin and blocked with 5% serum for 60 minutes at 21°C; antigen retrieval was by heat mediation in a 10mM Sodium citrate buffer. Samples were incubated with primary antibody (1/200 in blocking buffer) for 12 hours at 4°C. A Cy3®-conjugated donkey anti-rabbit IgG polyclonal (1/200) was used as the secondary antibody. 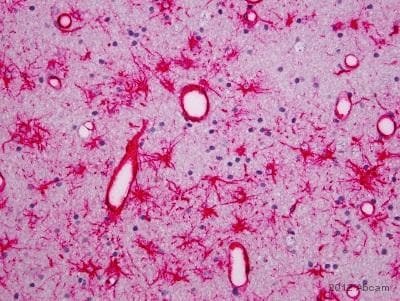 Formalin-fixed, paraffin-embedded human AD brain tissue stained for vimentin using ab92547 at 1/2000 dilution in immunohistochemical analysis. Paraformaldehyde-fixed mouse brain (Dentate Gyrus) stained for vimentin using ab92547 at 1/500 dilution in immunohistochemical analysis.